OUR KITCHEN RENOVATION WAS COMPETED 3 YEARS AGO. AND THE “REVEAL POST” IS TO DATE IS MY “MOST READ POST” . 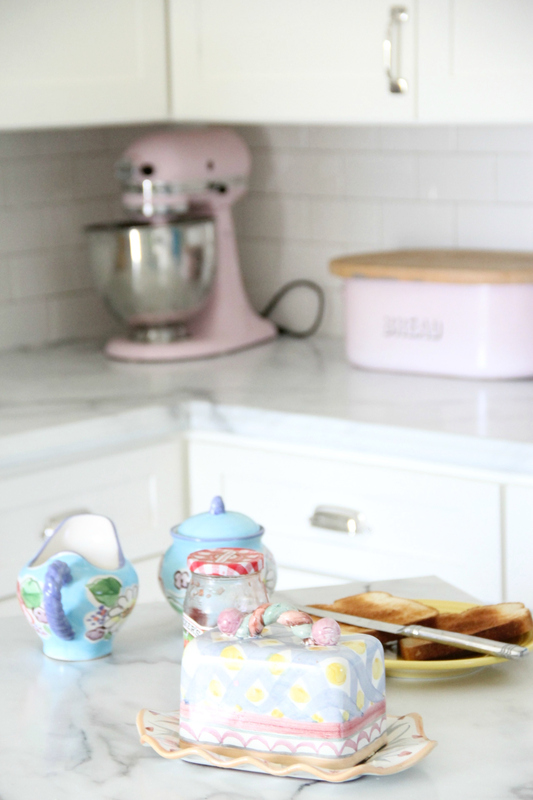 The kitchen renovation is one of those endeavors…like having 3 children under the age of 4…that I am not so sure I could do again…or at least wonder. “How did I DO THAT!” BUT SOMEHOW I DID…and it still works. I have thought about getting all new cabinets…but with a second DeVito heading to college…that is probably not going to happen. But I like to dream. ANYWAY…I thought i would be fun to share it with you, many of who never saw it the first time around! Enjoy! KITCHEN BEFORE- avocado oven and all! THIS IS WHAT WE STARTED WITH! In 1967, the kitchen was Built RIGHT in the space, meaning that no two cabinets measure exactly the same…the doors measure all ever so slightly different…BUT On the plus side, every single inch was used and there is little dead space…cause…you gotta find a “plus side”!!! THE MAYTAG DISHWASHER LASTED A MEER 2 YEARS BEFORE IT BROKE AND THE REPLACEMENT PART WAS GOING TO BE MORE THAN BUYING A NEW FRIGIDARE….LIVE AND LEARN…SO WE HAVE A FRIDGIDARE NOW. 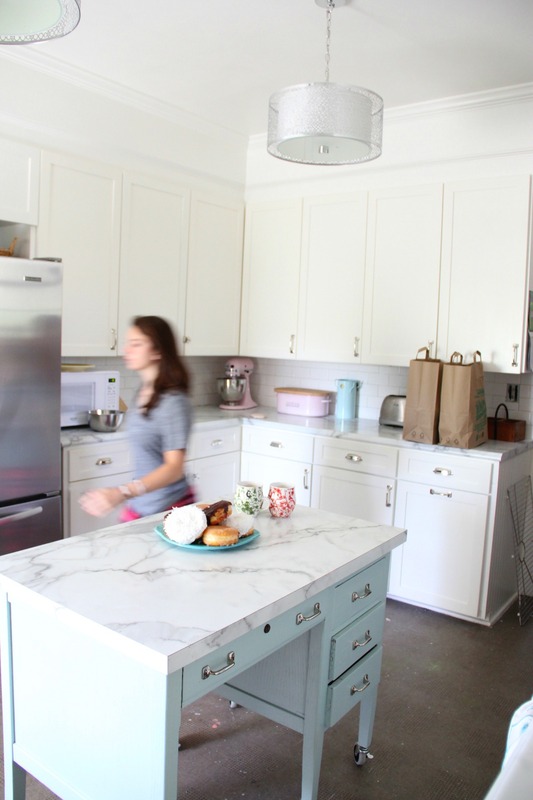 Each NEW feature of this room; the countertops, the appliances, the hardware…. represented hours and hours of price matching and figuring out…weighing the cost benefit of this versus that….etc etc…and mostly SAVING money…. 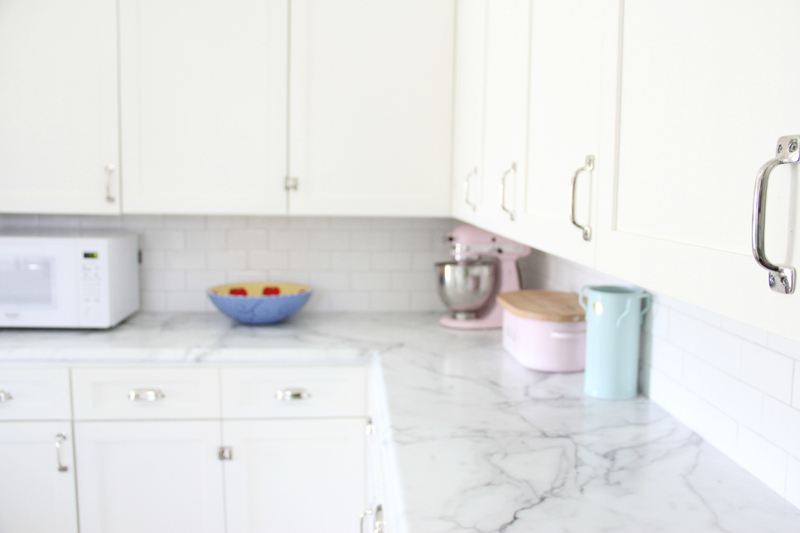 I saved because these countertops ARE ACTUALLY NOT MARBLE…. There is not a doubt in my mind that we could have saved an extra HUGE chunk of change had I gone with BUDGET hardware, LOW end inexpensive appliances, and an inexpensive knock off faucet. My goal was to GET THE BEST (within reason) FOR LESS!!! l challenge you to find any price LOWER than the ones I found for each of my purchases. THE PENDANTS ARE FROM LOWES. 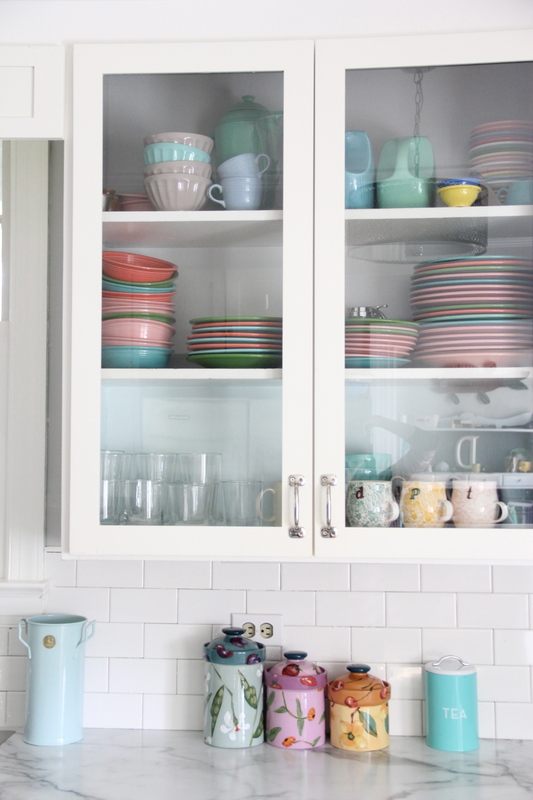 A FEW DAYS AFTER I ORIGINALLY POSTED OUR KITCHEN, I GOT AN EMAIL FROM FAMILY CIRCLE MAGAZINE. SEEMS THEY FEATURE A “BUDGET KITCHEN” MAKEOVER EACH YEAR AND WE HAD BEEN CHOSEN AS THAT YEARS “BUDGET KITCHEN OF THE YEAR!” . IN PREPARATION FOR THE PHOTO SHOOT, I PAINTED THE VINYL FLOORING WITH BENJAMIN MOORE PORCH AND FLOOR PAINT. ‘AEGEAN”(ALSO CALLED “PENCIL”) IS A STRAIGHT EDGE THAT DOES NOT WRAP AROUND THE BOTTOM. THIS EDGE RESEMBLED THE CUTS OF REAL MARBLE THAT I WAS MOST ATTRACTED TO. TWO MONTHS INTO THE ORDER COMPLETION, WE WERE TOLD AEGEAN WAS UNAVAILABLE. WE WERE BUMMED. SO, WE GOT THE MORE CURVY “AMORE” EDGE NSTEAD. 6 MONTHS AFTER THE KITCHEN WAS COMPLETED, THE FORMICA COMPANY CONTACTED US, WANTING TO MAKE THINGS RIGHT…THEY GRACIOUSLY REPLACED THE “AMORE EDGE” COUNTERTOPS WITH WHAT WE HAD ORIGINALLY WANTED. AEGEAN! TALK ABOUT GREAT CUSTOMER SERVICE!!! 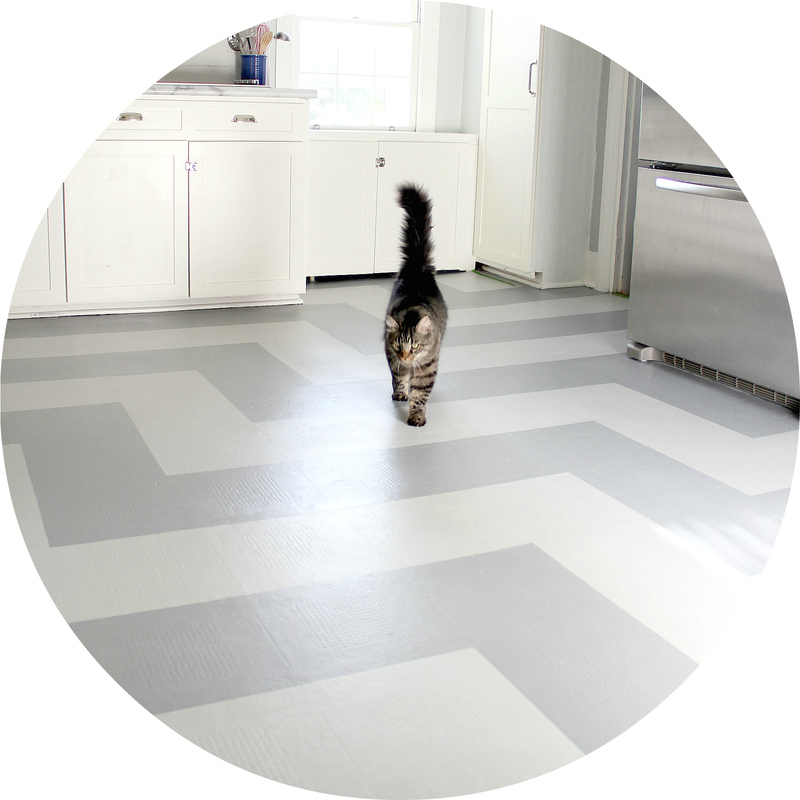 FORMICA MAKES A GREAT PRODUCT, AND FOR MANY, THEY PROVIDE AN ATTRACTIVE AND AFFORDABLE OPTION. I AM HAPPY TO REPORT THAT NEW TRAINING PROGRAMS HAVE BEEN INSTITUTED IN LOWES AND HOME DEPOTS ACROSS THE COUNTRY, MAKING THESE COUNTER TOPS MORE ACCESSIBLE. IF YOU ARE INTERESTED IN FORMICA 180X AND ENCOUNTER ANY ROAD BLOCKS, FEEL FREE TO EMAIL ME AND I WILL DO MY BEST TO CONNECT YOU WITH THE RIGHT PEOPLE!!!! CUTTING BOARD! HARDWARE FROM RESTORATION. I love the whole kitchen. The most amazing part to me is the floor. I’m glad you re-posted. I’d certainly seen pictures of your kitchen, but not the entire thing. I’ve always loved your hardware, but your floor was a fun surprise I’d missed before. Also, I totally get a kick out of Family Circle; I had no idea you’d been featured a few years back! 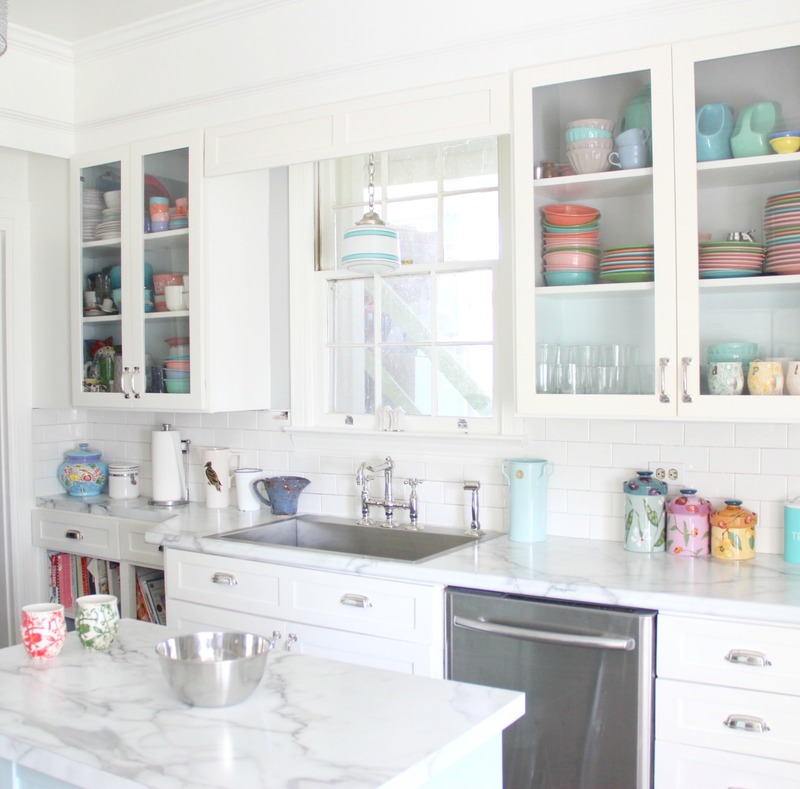 I love how you solved the marble cost issue with Formica! Unfortunately, after calling my local stores, neither Lowe’s nor Home Depot knew what Formica 180 fx was! Uh oh! How do I get this beautiful product installed in my house? Do I order directly from Formica? How about install, I don’t want to tackle that myself! Any help you can provide would be appreciated! Arghhhhh this drives me crazy! Try going to Lowes in person. They WILL have a sample of the product…they have to, but if they don’s let me know and I will put you in touch with my connection at Formica. YES THIS IS SO FRUSTRATING!!! I’ve been trying to hunt down the 180fx for months! I’ve been in person to a HD and a Lowes, and both ended up telling me they don’t have this product. Neither store had literature on the product and neither store knew what I was talking about even when I showed them pictures. I think I have finally found a contractor supply that can get it – working out the details with them. Wow, why make such a great product if they don’t make it accessible? I don’t know and it is frustrating . Email me your email and I will forward your inquiry to my contact at Formica. Your instincts were right…what a joke. What kind of grocery bags does she mean – cement!!!! That really annoys me when they steer people away from this product! It is a great product! We have the etched. and I like it fine. I think shiny would probably show more microscopic scratches over time. Plus it might be too shiny! go for it they are completely nuts! That being said…so what if you only have it 5 years??? ?…it is so inexpensive you could afford to change it if your taste changes…but with the real deal..costing at least $3000 a pop – you better like it for a loooonnnng time! I like the “amore” and the aegean or “pencil edge. I would steer you toward any edge that wraps around the bottom a bit because straight down edges can get water underneath by the sink. I honestly cannot remember what color grout we used but it will be in the posts about the kitchen. I was advised by Maria Killam from Color therapy blog that “Mountain Peak White” by Benjmain Moore works well with white subway tile so we went with that color. 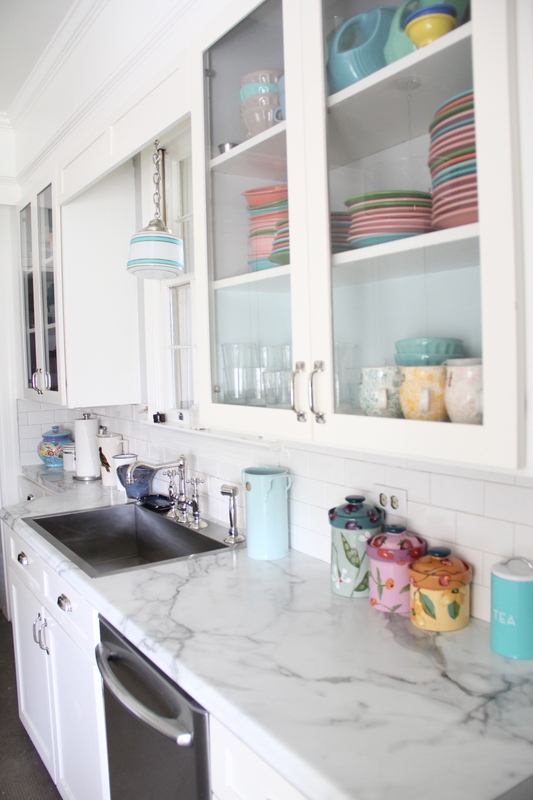 Leslie – is your sink right up against the back splash? I was told my counter depth would not be enough – that I needed 25 inches. How deep is your cabinet? Thanks Leslie. Did you clip your sink in? Previous Post Design Bloggers Conference 2016 – SOME HIGHLIGHTS!